Today I have with me Umezu-san, who was in charge of the Nintendo 3DS system’s design, Sugino-san, whose team was in charge of the exterior design and internal layout of the hardware, and Konno-san, who was the project producer. Thank you for joining me today. Umezu-san, would you start by introducing yourself? Sure. 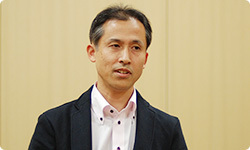 I’m Umezu from the Research and Engineering Department. My role was pulling together system design from the point of view of hardware, so I was in charge of specifications for SoC design. “SoC” is an abbreviation for “system on a chip.” These days it’s called that because all systems necessary for running a game system are placed on a single semiconductor chip. It used to be called a custom LSI.1 1Custom LSI: A large-scale integrated circuit specially designed and produced for a particular product. When were you put in charge of making custom LSIs? The first time was for Game Boy Color.2 Next was Game Boy Advance3 and Nintendo DS4, and now Nintendo 3DS. 2Game Boy Color: A handheld game system released in Japan in October 1998 as the successor to the Game Boy system. It featured a colour screen. 3Game Boy Advance: A handheld game system released in Japan in March 2001 as the successor to the Game Boy Color system. 4Nintendo DS: A handheld game system with two screens, one of which is a Touch Screen. It was released in Japan in December 2004. Game Boy Color came out in 1998, so you’ve been involved with LSI design for 12 years. Well, I began working on the design earlier than that. LSI and SoC design begins long before you know what is required of the new hardware or see what form it will take. In other words, when you begin SoC design, the people around you aren’t telling you what kind of functions they want in the new system or giving you any hints for development. Right. I have to imagine what kind of functions will be necessary for a handheld gaming system that will go on sale years in the future. You think about what may be possible years down the road and structure it accordingly. Yes. It doesn’t mean that we can keep it the way it is because what we released in the past is currently selling. Rather, it’s difficult because I have to purposely abandon the current situation and think of the next new thing. While the software developers are working as hard as they can on games for the hardware that’s now on sale, you are all alone thinking up the next hardware. Now, regarding Nintendo 3DS, you must have been thinking about what would come next about the time that Nintendo DS came out. Actually, when Nintendo DS came out, I had already finished SoC design, so I had begun thinking about what came after that! Oh, I see. Before even a single Nintendo DS system had been sold, you were already on to the next thing. What were you thinking about? First, I thought about the graphics - what kind of graphics would be required of the next generation system. Then I started fleshing it out. What kind of graphics did you think would be necessary in a future handheld gaming system at that time? I paid particular attention to home consoles. Even though it was a handheld, I wanted the visuals to be as close to those of a home console as possible. You had begun work without yet knowing whether the world would accept Nintendo DS with its two screens. Right. So, at first, I also considered a design without two screens. That never saw the light of day, though. And you didn’t just consider it, you actually made it. Yes. I actually made something that ran. But while I was doing that, Nintendo DS became well-received by a lot of people. About the time the Nintendo DSi5 system came out, I realised two screens was a must and began thinking about an early form of Nintendo 3DS. 5Nintendo DSi: A handheld game system released in Japan in November 2008 as an upgrade model of the Nintendo DS Lite system. It possesses various new features, such as bigger LCD screens and two cameras. I began thinking about the SoC that would be an early incarnation of the Nintendo 3DS system in the latter half of 2007. I wanted to achieve high-performance graphics, but if I allotted all the power to graphics, I wouldn’t be able to do anything else later. At that time, we hadn’t started talking about an LCD that would allow users to see 3D with the naked eye. Right. You have to be thrifty when it comes to the limited power of a handheld, so I designed the SoC with some leeway for putting in whatever surprise elements might come along later. You had to design it with leeway so that you could adapt to whatever ideas popped up later on. Sugino-san, you were in charge of hardware design. Would you please introduce yourself? I’m Sugino from the Research and Engineering Department. I’m manager of the Design Group, so I was responsible for the overall design of the Nintendo 3DS system. Your work as an industrial designer goes back quite a way to such products as the Play It Loud! series6 and Game Boy Pocket7, right? 6Play It Loud! : A series of the original Game Boy system released in different colours. 7Game Boy Pocket: A compact version of the original Game Boy handheld game system. It was released in Japan in July 1996. Yes. I also participated in Nintendo’s first 3D game system, Virtual Boy.8 8Virtual Boy: A 3D game system with a display in an eyepiece. It was released in Japan in July 1995. I imagine that in your work designing all those systems, you’ve noticed a lot of changes in materials and mounting technology. Yes, especially these last few years. Changes in materials and its miniaturisation for cell phones became particularly prominent. Such developments have proven incredibly informative in game system design as well. You’re also told to make it so it won’t break if you drop it, so you have to make a lot of tradeoffs, such that if you do this, you can’t do that. You thought you had made it as thin as you could from the very start. Yes. I mean, with a folding body and two LCDs, I didn’t see how it was possible. But when I gave it a shot, the result was the Nintendo DS Lite9 system. 9Nintendo DS Lite: A handheld game system released in Japan in March 2006. It features a thinner, lighter body than the original Nintendo DS model, and screen brightness can be adjusted to four different levels. When you changed your approach and got rid of all gaps, Nintendo DS Lite was born. I think that experience can be seen in Nintendo 3DS. 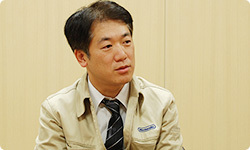 The first thing (Nobuo) Nagai-san10, who’s in charge at the Uji plant, said to me when he looked over the designs for Nintendo 3DS before mass production began was “This time it’s fully packed right from the start.” 10Nobuo Nagai: Senior Managing Director and Representative Director, Nintendo Co., Ltd. General Manager, Manufacturing Division. Yes. (laughs) When making Nintendo 3DS, we used all our tricks for Nintendo DS Lite - and more - for cutting down on size right from the start.